Grand Prairie Texas homes are generally built one of three ways: on a slab, over a basement (full or half), or over a crawlspace. In homes built over a basements, the inside portion of the sewer line is usually visible inside the basement where it exits the foundation wall. In crawlspace homes, the inside portion of the Grand Prairie Texas sewer line is underneath the home, and is only reachable if you enter from underneath the home. Homes on slabs feature sewer lines that are trapped in their entirety, and can only be accessed inside the home by cutting or jack hammering the concrete and getting to the piping. In all of these cases, the sewer line exits the home underground, runs through the yard and empties into the city or county's main line (see the manhole covers in your street?) via a tap. This tap is the point where the homeowner's property and city or county property meet, and is a common location for sewer line problems...more on that later. While generally shallow upon exiting the home (around 3-5 feet), sewer lines, due to the nature of some yards, can be as deep as 25 feet at the point where they meet the tap. This extreme depth is rare, however, usually resting at a 7-10 foot depth. Residential Grand Prairie Texas sewer lines are generally 4 inches in diameter, more than adequate to handle the average waste load of a typical home. Depending on the age of the home, the sewer line may be constructed of different materials. Much older homes often featured lines made of a hardened clay. While this material had very smooth interior walls and allowed for easy flow of waste, it was obviously flawed in that the clay would frequently break with underground settling or root growth, and was particularly susceptible to root penetration at the joints. In most cases with older homes (30-50 years old), cast iron was the material of choice for sewer line installations. Cast iron was much better then clay pipe in many ways: far greater strength, better sealed joints, and longer life span. As with any metal buried in the ground however, cast iron eventually revealed it's weakness after many years: tree roots. Cast iron sewer lines were joined in piecesby inserting one end of the pipe into the next via a hub (a flared end of the pipe). Then oakum (a hemp-like material) was pressed into the space around the inside pipe. Then melted lead was poured over the oakum to seal everything up. This method was durable, but over time the lead separated from the oakum and the sewer line joints began to weaken. This allowed roots to penetrate the line. Also, cast iron is weak against rust, and many years use would often rot out the bottom of the pipes, allowing for all sorts of problems. This rusting would also weaken the walls of the pipe, and crushed cast iron sewer lines are now a common problem. When cast iron is used today, which is rare, bands of rubber and steel are used to connect pieces together. When it comes time to replace or repair a home's sewer line, we cut NO corners. 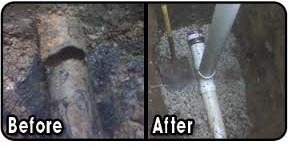 During replacements we extract the entire sewer line, from its exit at your home all the way to the street. We then replace the line with high-grade, schedule 40 (pressure-treated) PVC pipe, grade and slope the pipe properly, and all joints are solvent-welded. We also install two cleanouts (access points for any future maintenance); one at the home and one at the street. If necessary, we also install a backwater valve near the home to protect it in case the city's sewer overflows. Before testing and covering the new line we properly bed-in the sewer line. Bedding-in is a process that places a firm material (usually gravel or hard earth) under the pipe to eliminate the chances of the pipe's shape or flow being altered by: someone driving over it, ground settling, erosion, etc. Before covering up the new sewer line, we thoroughly test it to ensure that it flows smoothly and freely, as well to make sure that there are no leaks. After testing, we cover up the ditch made during the installation, grading the area in the process, and often seeding and laying out straw to aid in the re-growth of grass or other plants. Our sewer lines carry a 10-year warranty on parts, labor, and functionality.